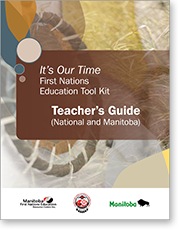 The Assembly of First Nations (AFN) developed the It's Our Time: First Nations Education Tool Kit Teacher's Guide to promote and enhance First Nations student success by preparing and collecting relevant resources for schools, teachers, facilitators, and other community stakeholders. The resource will also help to increase understanding of First Nations history and culture among Indigenous and non-Indigenous peoples by providing relevant tools and resources. The school-based aspects of the resource complement both First Nations and provincial curricula, and offer a teacher-friendly resource that can be used in creative and flexible ways.